This topic covers the advanced options available for configuring an approval chain. Advanced settings are for 4.0 and older versions. Approval chains are configured under System > Designers > Approval Chains	. To configure advanced options, select an approval chain (or, create a new one). Click on the Edit	link for the approval level needing advanced options configured. All of the settings established are only applicable to that particular level in the approval chain. Set the Approvers	properties as desired. Specify Time to Approve	- When enabled, the deadline for approving is set to one day by default. The Action to Take on Timeout	options determine the status of the request upon reaching the time allotted to approve. Approved	- Designates the request as approved. Rejected	- Designates the request as rejected. Escalated	- Will cause the approval chain to look to the next level of approvers upon time out. 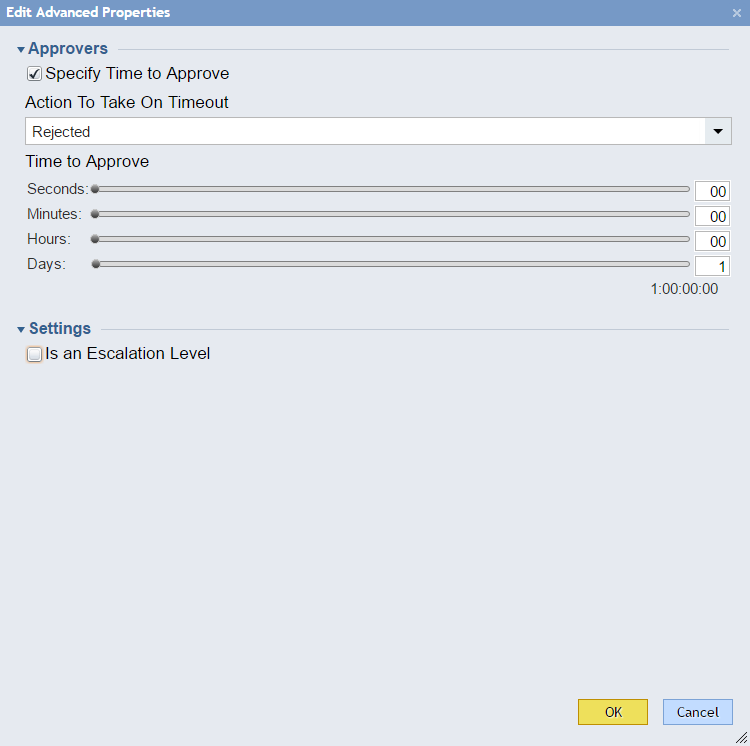 Use the sliders for the time frames to establish the time allotted for the approval step. Set the Settings	properties as desired. Is an Escalation Level	- Designate this level as an escalation level if the following conditions are true: (1) If the level is only reached after a previous level times out (i.e. not a part of the normal chain of processing), and (2) that previous level is also marked Escalated as the Action to Take on Timeout	option. Click OK	to save the changes. 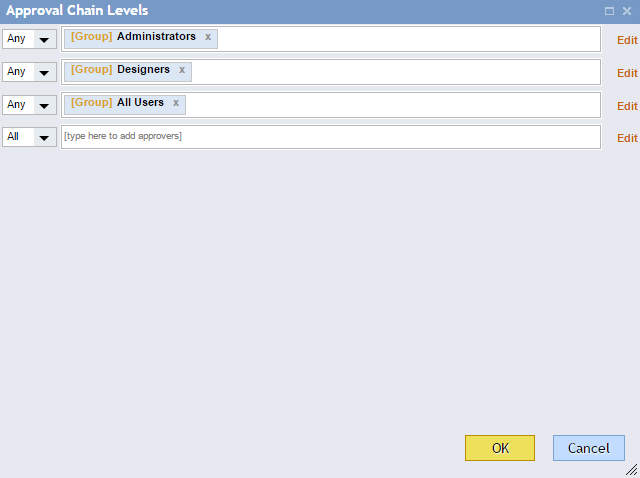 Configure additional approval levels in the approval chain as needed. To see the approval levels in a flow, see the video for this topic above.